As Wonder put it: "While it's critical to not act to the detriment of the authors who created these great works that enlighten and nourish our minds, hearts and souls, we must develop a protocol that allows the easy import and export of copyrighted material so that people with print disabilities can join the mainstream of the literate world.... It can be done." We couldn’t agree more. That’s why we filed comments last year with the US Copyright Office in support of moving forward with this treaty. And it’s also why we work to make content available in accessible formats, including making the over 2 million out-of-copyright books that we’ve digitized as part of Google Books available for free and in an accessible form. You can watch Wonder’s speech (and My Cherie Amour sing-along with UN delegates) below. Google grew by more than 16,000 people between 2005 and 2009 -- a five fold increase in the size of our company. In fact, we were hiring so fast that on average 40 new recruits were joining every day by 2007. At the same time, we were also building partnerships with other technology companies to help improve our products and services. In order to maintain a good working relationship with these companies, in 2005 we decided not to “cold call” employees at a few of our partner companies. Our policy only impacted cold calling, and we continued to recruit from these companies through LinkedIn, job fairs, employee referrals, or when candidates approached Google directly. In fact, we hired hundreds of employees from the companies involved during this time period. A number of other tech companies had similar “no cold call” policies -- policies which the U.S. Justice Department has been investigating for the past year. Earlier today, the Justice Department announced a settlement with several of these companies -- including Google -- which brings the investigation to a close. While there’s no evidence that our policy hindered hiring or affected wages, we abandoned our “no cold calling” policy in late 2009 once the Justice Department raised concerns, and are happy to continue with this approach as part of this settlement. For several years now, the tech industry, the public interest community, and entrepreneurs have been clamoring for the green light to begin innovating and building new products for these airwaves on an unlicensed basis. Today’s order finally sets the stage for the next generation of wireless technologies to emerge, and is an important victory for Internet users across the country. Chairman Genachowski and his fellow Commissioners deserve ample credit for adopting rules that ultimately will put better and faster wireless broadband connections in the hands of the public. We’re glad to see that the FCC appears to have rejected calls to enact burdensome and unnecessary constraints that would have made it more difficult to deploy useful technologies on these airwaves. Instead, the Commission has put forward common-sense rules that will help encourage innovation, while fully safeguarding incumbent signals from interference. What’s next on TV white spaces? We’re hopeful the FCC soon will name one or more administrators of the geolocation database, and establish the ground rules for its operation. Once the database is up and running, new white spaces devices and tools can begin to roll out to consumers. Nonetheless, this important step should be viewed as the beginning, and not the end, of crafting forward-looking spectrum policy for our country. From creating a comprehensive spectrum inventory, to investigating incentive auctions for TV broadcast spectrum, to revisiting the efficacy of spectrum sensing technologies, these are exciting times for folks to get involved in developing more efficient and effective policies to govern our nation’s airwaves. The Electronic Communications Privacy Act (ECPA) is the law that regulates how government agencies can access a user’s electronic data from an online service provider. Unfortunately, the law was written in 1986 and is woefully out of date for today’s technology -- the provisions of the law no longer match people’s reasonable privacy protections for their digital data. My colleague Richard Salgado should know. He’s a former Department of Justice lawyer and currently serves as Google’s Senior Counsel for Law Enforcement and Information Security, where he oversees our team that evaluates and responds to law enforcement requests. Today he’ll be testifying about Google’s ongoing efforts to update ECPA for the digital age. As part of our efforts, earlier this year Google helped launch Digital Due Process, a coalition of tech companies, privacy advocates, and academics dedicated to reforming ECPA. Since our launch, we’ve met with numerous members of Congress, as well as officials from the Department of Justice and several law enforcement agencies. We’ve also expanded our ranks, with more companies and groups from across the political spectrum joining the campaign. Today’s hearing follows similar hearings before other Senate and House committees, and is another sign of the growing momentum of our effort. Check out Digital Due Process to learn more about our efforts to ensure our laws reflect the way we live our lives today. With the midterm elections in the U.S. just six weeks away, everyone is wondering how the balance of power between Republicans and Democrats will shake out after November 2. Although more than 500 seats will be decided in House, Senate, and Governor races, the current tallies are so close that individual races are receiving great scrutiny: you’ll find several sources providing estimations for how each race is leaning. To make tracking the blues and reds a little easier for armchair pundits, we’ve partnered with some of the most respected names in politics—Cook, Rothenberg, CQ-Roll Call and RealClearPolitics—to put their ratings in the same place and on the same map. You can find it at maps.google.com/elections2010. The map initially shows loads with states shaded according to one of the sources’ ratings of the Senate race; click the links on the left to switch to House or Governor races, or to switch sources. 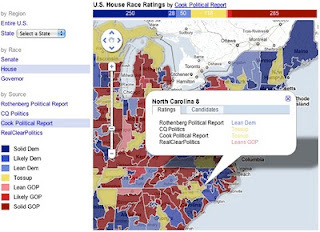 To compare the ratings head-to-head, click a given state or district, and you’ll see ratings from each source displayed. We refresh the data daily based on the latest ratings, so come back as the races develop. If you would like to put this map in your own website, you can embed it as a gadget and grab the code here. This gadget is powered by the highly flexible yet simple-to-build-on Fusion Tables, which directly integrates into Google Maps API v3. Even if you’re not a programmer, there’s a lot that you can do with Fusion Tables to manipulate and visualize data, and in the spirit of the season, check out our new tutorial that demonstrates how to analyze Census data by congressional district and share what you’ve come up with. Along with other initiatives, including the Election Center with our Public Sector team and You Choose at YouTube, this map gadget is an important way that we’re working to improve communication, discourse and understanding of the political process. The development of the Internet as a global, free and open resource is a constant challenge. The dynamic and decentralized nature of the Internet offers new opportunities for communication and free expression as well as new threats. Today we have reached a critical moment in time when governments that wish to control the spread of information and individuals using digital technologies to promote change are becoming increasingly sophisticated and strategic as they confront each other around the world. This week in Budapest, Google and the Central European University are sponsoring Internet at Liberty 2010: The Promise and Peril of Online Free Expression, a conference that brings together grassroots global activists alongside representatives of NGOs, academic centers, governments and corporations in order to explore the many issues at hand. The conference will explore creative ways to address the boundaries of online free expression; the complex relationship among technology, economic growth and human rights; ways in which dissidents and governments are using the internet; the role of internet intermediaries; as well as pressing policy and legal issues such as privacy and cybersecurity. You can follow the live stream of the conference from wherever you are. When Google’s services are blocked or filtered, we can’t serve our users effectively. That’s why we act every day to maximize free expression and access to information. To promote transparency around this flow of information, we’ve built an interactive online Transparency Report with tools that allow people to see where governments are demanding that we remove content and where Google services are being blocked. We believe that this kind of transparency can be a deterrent to censorship. Like all companies, Google’s services occasionally experience traffic disruptions. Our new traffic tracking tool helps us and others track whether these interruptions are related to mechanical outages or are government-induced. Each traffic graph shows historic traffic patterns for a given country and service. Graphs are updated as data is collected, then normalized and scaled in units of 0 to 100. This new tool—which is global and includes China—will replace the Mainland China service availability chart, which showed product access for China alone. By showing outages, the traffic graphs visualize disruptions in the free flow of information, whether it's a government blocking information or a cable being cut. For example, the graphs show that YouTube has been inaccessible in Iran since June 12, 2009, following the disputed presidential election. In April we also created a website that shows the number of government inquiries for information about users and requests for Google to take down or censor content. Today we’re updating this interactive Government Requests map with data from the first six months of 2010. We’ve also updated our analysis of the trends we saw across the data over the past six months. The new data for 2010 now includes the number of individual items asked to be removed, per country (for example, there may be many URLs per a single request.) You can learn more about trends in the data here. We view this as a concrete step that, we hope, will encourage both companies and governments to be similarly transparent. Free expression is one of our core values. We believe that more information means more choice, more freedom and ultimately more power for the individual. Free expression is, of course, also at the heart of Google’s business. Our products are specifically designed to help people create, communicate, share opinions and find information across the globe. We hope this step toward greater transparency—and these tools—will help in ongoing discussions about the free flow of information. Last week, "Googling something" took on a whole new meaning. Instead of typing your question into the search box and hitting Enter, our newest invention—Google Instant—shows constantly evolving results based on the individual letters you type. Instant is just the latest in a long line of search improvements. Five years ago, search results were just "ten blue links"—simple web pages with some text. Today search engines provide answers in the form of images, books, news, music, maps and even "real time" results from sites such as Twitter. The reason for all these improvements is simple: It's what you want. When you type in "weather" (or just "w" in the case of Google Instant), you want the weather forecast right away—not a collection of links about meteorology. Type in "flights to San Francisco," and you most likely want flight options and prices, not more links asking you to enter the same query again. We know these things with a fair degree of certainty. We hire lots of great computer scientists, psychologists, and linguists, who all contribute to the quality of our results. We carefully analyze how people use Google, and what they want. And what they want is quite obvious: the most useful, relevant results, as quickly as possible. Sounds pretty simple. But as Google has become a bigger part of people's lives, a handful of critics and competitors have raised questions about the "fairness" of our search engine—why do some websites get higher rankings than others? It's important to remember that we built Google to delight our users—not necessarily website owners. Given that not every website can be at the top of the results, or even appear on the first page of our results, it's not surprising that some less relevant, lower-quality websites will be unhappy with their rankings. Some might say that an alphabetical listing or a perfectly randomized list would be most "fair"—but that would clearly be pretty useless for users. People often ask how we rank our "own" content, like maps, news or images. In the case of images or news, it's not actually Google's content, but rather snippets and links to content offered by publishers. We're merely grouping particular types of content together to make things easier for users. In other cases, we might show you a Google Map when you search for an address. But our users expect that, and we make a point of including competing map services in our search results (go ahead, search for "maps" in Google). And sometimes users just want quick answers. If you type "100 US dollars in British pounds," for example, you probably want to know that it's "£63.9p"—not just see links to currency conversion websites. Google's search algorithm is actually one of the world's worst kept secrets. PageRank, one of our allegedly "secret ingredients," is a formula that can be found in its entirety everywhere from academic journals to Wikipedia. We provide more information about our ranking signals than any other search engine. We operate a webmaster forum, provide tips and YouTube videos, and offer diagnostic tools that help websites identify problems. Making our systems 100% transparent would not help users, but it would help the bad guys and spammers who try game the system. When you type "Nigeria" you probably want to learn about the country. You probably don't want to see a bunch of sites from folks offering to send you money . . . if you would only give them your bank account number! We may be the world's most popular search engine, but at the end of the day our competition is literally just one click away. If we messed with results in a way that didn't serve our users' interests, they would and should simply go elsewhere—not just to other search engines like Bing, but to specialized sites like Amazon, eBay or Zillow. People are increasingly experiencing the Web through social networks like Facebook. And mobile and tablet apps are a newer alternative for accessing information. Search engines aren't the "gatekeepers" that critics claim. For example, according to the research firm Compete, Google is responsible for only 19% of traffic to WSJ.com. Investment and innovation are considered strong indicators of a competitive marketplace. Last week's launch of Google Instant was a big bet for us—both in terms of the complexity of the computer science and the huge demands it puts on our systems. Competition for eyeballs on the Web helps drive that risk-taking and innovation because consumers really do have the freedom to vote with their clicks and choose another search engine or website. In an industry focused on tough questions, that's clearly the right answer. Mr. Singhal is a Google fellow who has worked in the field of search for over 15 years, first as an academic researcher and now as an engineer. I’m in Logan, Ohio, today to announce that Spectrum Bridge, the Hocking Valley Community Hospital, and Google have teamed up to deploy a broadband network using the TV white spaces. This is an exciting new deployment – the first of its kind for a hospital – demonstrating the potential of the TV white spaces to improve broadband and spark new applications in healthcare. First responder vehicles, hospital grounds as well as the health department are being equipped with high-speed wireless Internet access. Additionally, the hospital is using the network to manage its outdoor video surveillance system. This deployment is operating on an experimental white spaces license granted by the FCC. Next Thursday, September 23, the Commission will be voting on final technical rules governing the white spaces – a vote that could pave the way for unlicensed white spaces deployments across the country. We’re excited that the final rules are up for a vote, and can’t wait to see how entrepreneurs and innovators nationwide will use unlicensed white spaces to introduce cool new products and services. Stay tuned to this blog for an update from this morning’s launch event. Updated with video from the event below. Let's say you go to a documentary screening at the National Archives. After the screening your friend really wants gelato. You search for a place nearby on your phone. Along with your search results you see an ad for a gelato bar that, turns out, is only a block away. Your friend gets bourbon vanilla and you get pistachio. Everyone is happy. How did your phone know to serve you a gelato ad for a place around the corner instead of Georgetown? It's called geo-location advertising, and along with innovations like social advertising, interest-based advertising, and pay-per-click search ads, it's one of the biggest things in online advertising. The U.S. online advertising economy is now $25 billion a year. But this growing space is little understood in Washington. Why are advertisers shifting money from TV and print to the web? How are ad prices set? Do those banner ads really work? Is geo-location a threat or new way to get discounts from your favorite stores? Will the iPad and tablet devices hurt newspapers or lead to their rebirth? As part of our ongoing Google D.C. Talks series, and in conjunction with DC AdWeek, we'll discuss these questions and more with the Interactive Advertising Bureau's leader Randall Rothenberg and industry experts in search, display, and social advertising. The discussion will cover the basics of online advertising as well as emerging trends and interesting uses. Earlier this year the FCC launched a wide-ranging Data Innovation Initiative to improve the ways it collects, analyzes, and disseminates information about the state of broadband in the United States. They’ve already made great strides, launching a Consumer Broadband Test and a Spectrum Dashboard. In comments filed today, we offered some ideas on how the FCC can take these efforts to the next level. Data innovation depends on open data. The more open and transparent the FCC makes its broadband measurement data, the easier it will be for third-parties to build on them – to analyze the information, layer it on top of maps, or create other user-friendly reports. Some of the most useful insights may come from network researchers engaging in deep analysis of raw data, as well as examining and comparing different data sets. Open data also will drive better measurement over time. There’s a common saying among open source advocates: Given enough eyeballs, all bugs are shallow. Providing open access to the raw data will help network researchers and others identify shortcomings and improve methodologies. The Commission has made some good progress on this front. For example, last week the FCC released software to help others build on the results of its Consumer Broadband Test. This test uses the Network Diagnostic Tool that runs on Measurement Lab (M-Lab), an open platform for broadband measurement. All M-Lab test results – currently, over 100 terabytes of information – are made publicly available so that anyone can build on and learn from the data without restriction (data is currently available through Amazon Web Services, Google Big Query and Google Storage for Developers). The FCC is now building on this effort through the TestMyISP project, a collaboration with SamKnows, to comprehensively measure U.S. broadband quality. The project intends to make use of M-Lab, and make the resulting data openly available. As the FCC embarks on this and other measurement projects, maximizing openness and transparency will be absolutely essential. Online censorship as a trade barrier? Earlier this week U.S. Trade Representative Ambassador Ron Kirk held a roundtable with a cross section of Silicon Valley companies to discuss trade challenges and opportunities faced by the U.S. tech sector. One of the strongest themes? How online censorship functions as a trade barrier for U.S. technology companies abroad. Both Google and Facebook discussed the importance of strengthening laws and treaties to ensure the free flow of information online so that U.S. companies can compete on a level playing field abroad. The event was hosted by the Global Innovation Forum, a project of the National Foreign Trade Council, and can be watched here. On November 4, 2008, as millions of Americans lined up to cast their ballots in a historic presidential election, another important vote was taking place at the Federal Communications Commission. After some six years of careful study, that morning the FCC voted unanimously to open the TV “white spaces” spectrum – the unused airwaves between broadcast TV channels – to unlicensed uses by all Americans. Two weeks from today, the five current FCC Commissioners will meet to set final technical rules for the white spaces. If it gets the rules right, the Commission will have taken a huge step to put better and faster Internet connections in the hands of the public. Thanks to their unique range and strength, the TV white spaces are sometimes referred to as “Wi-Fi on steroids,” powerful enough to unlock new innovations and applications that simply are not possible over traditional Wi-Fi. Demonstration projects across the country are giving us a small sneak peak of what’s possible with the white spaces – for example, Wilmington, North Carolina, has blanketed its city with wireless Internet access, while Plumas County, California, is running a “smart grid” wireless network. Indeed, one of the great advantages of the white spaces is that ordinary citizens can employ them in a wide variety of ways, without the need to formally apply for (let alone purchase) a spectrum license from the FCC. In setting the final rules, there are at least two critical issues the FCC needs to address. First, when it comes to interference protection, the Commission should support a geolocation solution. A few opponents of unlicensed white spaces have demanded that the FCC also require a spectrum-sensing solution, a move that would be redundant and expensive, and could severely limit commercial investment. Second, the Commission should establish a reasonable “keep-out” zone for wireless microphones. This will protect the users of authorized wireless microphones, while also allowing white spaces devices to operate in big cities, where spectrum is a coveted resource. Additionally, once the rules are set, the FCC will need to authorize one or more white spaces database administrators. Google and many others in the tech industry are eager finally to get the green light to start innovating and building new services on these airwaves. From new wireless devices, to better broadband access, to more reliable communications networks for emergency responders, to better-connected classrooms – the white spaces have the potential to spark the next-generation of wireless communications. Helping your children use the Internet safely is similar to teaching them to navigate the offline world. There are parts of the real world that you wouldn’t let your children explore unsupervised—and that goes for the online world as well. But while most of us remember being taught to cross the road and not talk to strangers, we probably weren’t taught how much personal information we should share online or how to handle cyberbullies. Therefore, it’s no surprise when parents and teachers tell us they want to learn more about how to help their kids use the Internet safely and responsibly. Today, we’re launching our new Family Safety Center; a one-stop shop about staying safe online. We’ve included advice from leading child safety organizations around the world, tips and ideas from parents here at Google, as well as information on how to use the safety tools and controls built into Google products. 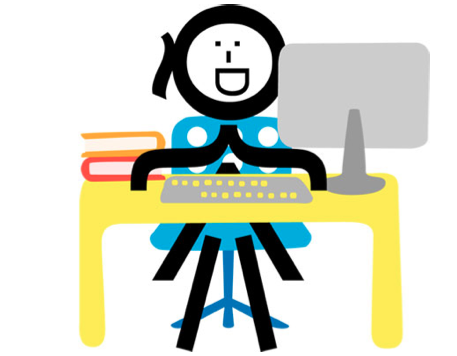 For day-to-day practical tips we asked some of our parents at Google to share their own ideas. Tactics they use range from limiting screen time and preventing computers in kids’ bedrooms to ad hoc checks on their browser history and social networking profiles. Everyone has different ideas and there’s no right or wrong answer, but hopefully some of these will resonate and inspire you. See more videos and let us know your own thoughts on our YouTube channel. To answer some of the toughest questions most important to parents, such as accessing inappropriate content and meeting strangers online, we went straight to the people that know best; the organizations that advocate and promote child safety and digital literacy. Organizations that we’ve partnered with around the world include the U.S. Federal Trade Commission’s OnGuard Online initiative, the Canadian Centre for Child Protection, the Australian Communications and Media Authority, U.K.’s ChildNet, and New Zealand’s NetSafe. The new Safety Center also provides information on the safety tools built into Google products. SafeSearch and YouTube Safety Mode can help you control what content your children stumble across. Sharing controls in YouTube, Picasa, Blogger and others ensure your videos, photos and blogs are shared only with the right people. And in response to popular requests, we’ve added a section on managing geolocation features on mobiles. With kids growing up in an age where digital know-how is essential, it’s increasingly important to ensure that they’re developing healthy, safe and responsible online habits. And we’re thinking every day about how we can help parents and teachers to do just that. My father was in the Army while I was growing up and I moved around a lot. It was fun and exciting but occasionally a little sad since every two years I packed up my things and said goodbye to my friends. We always promised to stay in touch but as addresses changed and phone numbers got lost we eventually drifted apart. Thanks to technology, military children today have a much easier time keeping in touch with old friends and making new ones at the same time. During a time of increased deployments and separation the Internet also makes talking to family halfway around the world a snap. In fact, military families use the Internet at greater rates than the civilian population. Knowing the pitfalls of the Internet and how to navigate it safely helps adolescents and parents protect themselves and establishes a safer online environment. That’s why we think it’s important to help military families be smart and safe online. Today, we’re proud to announce that we’ve teamed up with the organization Blue Star Families to promote and distribute our Digital Literacy curriculum to their members worldwide through their website and social networks. Blue Star Families is a group of military spouses and families from all over the country who work hard to to support, connect and empower military families. Last Veterans Day, we partnered with them to distribute priority Google Voice invitations, helping families stay in closer touch with their loved ones. Being a military kid is tough enough. By working with organizations like Blue Star Families our goal is to help kids today keep in touch, safely, online. We've always worked hard to ensure that our success is earned the right way -- by building great products, not locking in our users or advertisers. That said, we recognize that as Google grows, we’re going to face more questions about how our business works. As Search Engine Land first reported, we've recently been approached by Texas Attorney General Greg Abbott’s office, which is conducting an antitrust review of Google. We look forward to answering their questions because we’re confident that Google operates in the best interests of our users. Occasionally, we’re asked about the “fairness” of our search engine -- why do some websites get higher rankings than others? The important thing to remember is that we built Google to provide the most useful, relevant search results and ads for users. In other words, our focus is on users, not websites. Given that not every website can be at the top of the results, or even appear on the first page of our results, it’s unsurprising that some less relevant, lower quality websites will be unhappy with their ranking. SourceTool/TradeComet - SourceTool is a website run by parent company TradeComet, whose private antitrust lawsuit against Google was dismissed by a federal judge earlier this year. The media have noted that TradeComet is represented by longtime Microsoft antitrust attorneys, and independent search experts have called SourceTool a “click arbitrage” site with little original content. myTriggers - Another site represented by Microsoft’s antitrust attorneys, myTriggers alleges that they suffered a drop in traffic because Google reduced their ad quality ratings. But recent filings have revealed that the company’s own servers overheated, explaining their reduced traffic. We work hard to explain our approach to search and how our ranking works, and we also listen carefully to people’s concerns. We’re looking forward to working cooperatively with the Texas Attorney General’s office, and we strongly believe our business practices reflect our commitment to build great products for the benefit of users everywhere. Long, complicated and lawyerly—that's what most people think about privacy policies, and for good reason. Even taking into account that they’re legal documents, most privacy policies are still too hard to understand. A new privacy tools page to the Google Privacy Center. This will mean that our most popular privacy tools are now all in one place. Our updated privacy policies still might not be your top choice for beach reading (I am, after all, still a lawyer), but hopefully you’ll find the improvements to be a step in the right direction. YouTube’s Margaret Gould Stewart recently gave a TED talk about how YouTube’s Content ID system cross-references over 24 hours of uploaded content a minute with our rights holder database to give copyright owners choices. In the video, she shows how the Content ID technology works and explains, “The scale and speed of the system is breathtaking… We’re talking about over a hundred of years of video a day. It would be like 36,000 people staring at 36,000 monitors each and everyday without so much as coffee break.” Check it out.